Home Showbiz Bollywood SRK & Akshay Kumar to work together in new film? SRK & Akshay Kumar to work together in new film? Akshay Kumar & SRK to work together? 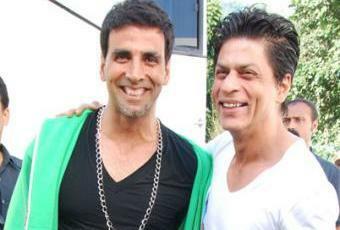 Shah Rukh Khan and Akshay Kumar are expected to put their differences aside and work together in a new film. According to Times Of India, the two actors who have been in the news a lot recently due to the box office clash this Eid with ‘Chennai Express’ and ‘Once Upon Time In Mumbai Again’ – could tie-up together for a new project. Apparently the PR companies for both stars had churned out stories about their so-called rivalry between King Khan and Kumar – but it was planned to build their image for a new film together. “Akshay and Shah Rukh had two meetings regarding this but things didn’t work out. However, SRK has assured Akshay that he will work out something once they figure out the right script,” the source added.